Welcome and thank you for visiting the website of Dolphin Access Lifts – the independent wheelchair platform lift specialists. Best advice, creativity, flexibility, delivering promises, quality products and after sales service - we passionately believe in all of these things. Experience; if our 20+ years of experience has taught us anything, it is to listen to our customers. Each new project genuinely excites us and we are only too aware that your project is different to any other. Whether it is a specific design requirement, budget or delivery (or a mixture of all of these things) our mission is to provide the solution. Independence; whatever the building constraints or whichever type of lift you require, vertical lift (long or short travel, indoors or outdoors, enclosed or open aspect) or platform stairlift (straight or curved stairways, indoors or outdoors), we have a model from our vast range of suppliers (worldwide) to suit your requirements. Let us help you to meet the requirements of the Disability Discrimination Act and Part ‘M’ of the Building Regulations. 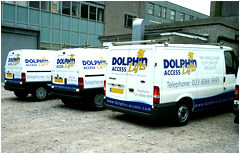 Call Dolphin Access Lifts on 01276 485 799.